Des Brennan visited RAF Kinloss to witness the second Combined Qualified Weapons Instructors Course of the year 2006. The MILAVIA report by me on the Combined Qualified Weapons Instructors Course (CQWIC) held at RAF Leuchars in November 2005 explained the format of these twice-yearly courses for experienced fast-jet aircrew. 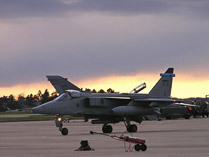 For several years the combined element of the course has been held at RAF Leuchars in Fife however the second course of 2006 (with at least the next few to follow while the Leuchars runway is resurfaced during much of 2007) was held instead over 100 miles to the north at RAF Kinloss in Moray. This element of the course took place under quite difficult conditions between 13th. and 24th.November, 2006. During the period of the course many of the funerals of the Kinloss based Nimrod crew who lost their lives in Afghanistan took place in the area which was obviously stressful for station personnel and their families plus the weather was fairly consistently bad over both weeks which added to the workload of both air and groundcrew involved in the course itself. RAF Kinloss is home to the Royal Air Force`s Nimrod MR.2 Maritime Reconnaissance Fleet and is located on the on the Moray Firth coast. It is within minutes of both, the low-flying areas of the Scottish Highlands and the bombing range at Tain and has large areas of ramp space only part of which was being used by resident and course aircraft. The extent of these was readily apparent while travelling around the airfield perimeter to the Visiting Aircraft ramp which was hosting all of the “fast jet” participants except the Typhoons. By coincidence the same ramp as used on my only other visit to Kinloss in May 1972 during a parachute exercise when I joined an Andover there for a one-way night flight into the hills. Typhoon F.2 from 3 Sqn. Tornado F.3 from 56(R) Sqn. (OCU) with support from 25 Sqn. 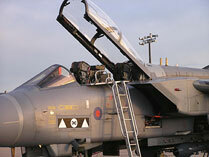 Tornado GR.4 from XV (R) (OCU) with support from the Marham and Lossiemouth Wings. Harrier GR.9 and T.10 from 20(R) Sqn (OCU) with support from operational units. Jaguar GR.3 and T.4 from 6 Sqn. Tornado GR.4 , F.3 and Harrier GR.9 from 41 Sqn (formerly the Air Warfare Centre). AEW was provided by an E-3D Sentry of 8/23 Sqn and Sea King ASaC.7s of 849 Sqn. Threat simulation was by Falcon 20s of FR Aviation along with Hawks from 100 Sqn and RAF Valley units. One Hercules from the Lyneham Transport Wing. My visit coincided with some of the Nimrod aircrew funerals mentioned earlier and as a result timing slipped into late afternoon which restricted aircraft access but did allow for some interesting light conditions over the space of an hour on one of the brighter days of the course, ranging from very strong, low winter sunlight to rapidly falling dusk. Evident on most of the aircraft is the white coloured missile body shaped Rangeless Airborne Instrumented De-Briefing System (RAIDS) Pods which fit standard Sidewinder launch rails and allow real-time monitoring and later debriefing of the exercise. Coinciding with the CQWIC course at Kinloss was the opening of a dedicated car park and shelter for both bird and aircraft watchers outside the western side of the airfield. This is the result of cooperation between RAF Kinloss and the local Community Council and is situated on the road to Findhorn near the end of the runway. Road safety is of great concern locally after a small child was killed there a few years ago and visitors are urged to be sensitive to this and avoid indiscriminate parking as well as taking care while on foot along the edges of what is a 60 mph limit stretch of roadway. With thanks to the Corporate Communications Office staff at RAF Kinloss for hosting the visit on a very difficult day for them and the station, and to “Rab” Anderson of the Leuchars Aviation Group for his usual tireless work in arranging this visit.